On this date in 1933, with the Reichstag (German parliament building) still smol­dering following the fire set by 24-year-old Dutch Com­munist Marinus van der Lubbe the day before, Ger­man Chan­cellor Adolf Hitler per­suaded 87-year-old Pre­si­dent Paul von Hinden­burg to sign the Reichs­tag Fire Edict. The emer­gency decree sus­pended key civil liberty sec­tions of Ger­many’s Wei­mar con­sti­tu­tion, among them the right to free expres­sion of opin­ion, in­cluding a free press, and free­dom of assem­bly and asso­ci­a­tion. The signa­ture of the ailing, senes­cent Hinden­burg quickly con­verted Ger­many from a par­lia­men­tary demo­cracy led by a would-be dic­ta­tor into an abso­lute total­i­tar­ian state. It happened so fast—in less than a month. With par­lia­men­tary elec­tions sched­uled for March 5, five days away, Hitler, who had dis­solved parlia­ment two days after being named chan­cellor on Janu­ary 30, ordered the arrests of thou­sands of opposi­tion Com­munists, in­cluding the party’s head, and rank and file Social Demo­crats, whose leader­ship had already fled to the safety of the Czech capi­tal, Prague. Hitler’s para­military SA (Sturm­ab­teilung, or “Storm Detach­ment”) goons, nick­named “brown­shirts,” wreaked havoc every­where they could, breaking into homes and busi­ness all across the coun­try and beating and tor­turing the vic­tims they dragged out and jailed. On March 5 Nazi organi­za­tions “moni­tored” polling places. Despite their best efforts to emas­cu­late and intim­i­date their oppo­nents, the Nazis failed to gain an ab­so­lute major­ity of the 39.6 mil­lion votes cast, gar­nering just under 44 per­cent to control 288 seats in the Reichs­tag; the Nazis needed the con­ser­vative Ger­man National Peo­ple’s Party, which had 52 seats as well as posts in Hitler’s coali­tion cabi­net, to govern the coun­try. To for­mally and legally place the whole power of govern­ment in his hands, Hitler on March 23 urged the Reichs­tag to enact and Hinden­burg to sign the En­abling Act (Er­maech­tigungs­gesetz). The act, known formally as Law to Remedy the Distress of the People and the Nation, granted Hitler’s cabi­net the autho­rity to en­act laws with­out the partic­i­pa­tion of the Reichs­tag or his coali­tion part­ners. Thus using the tools of parlia­men­tary demo­cracy, Hitler gained un­restricted free­dom to ban all poli­tical parties except his own and to ter­rorize, arrest, beat, im­prison, torture, and kill any and all of his opponents. Above: Before the Reichstag burned: Joseph Ferdinand Klemm’s painting of the Ger­man Reichs­tag and the Bis­marck Memo­rial in the Koenigs­platz (“Square of the King”), Berlin, 1910. After the fire Reichs­tag members met in the Kroll Opera House (Kroll­oper), at the oppo­site end of Koenigs­platz, which is now a large grassy expanse called Platz der Republik (“Square of the Republic”). Both the Bismarck Memorial and Kroll Opera House are gone. 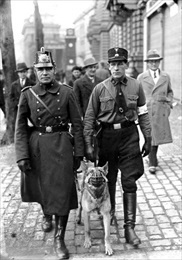 Left: Tasked with keeping peace and order on election day, March 5, 1933, a Berlin police­man and a Nazi SS (Schutz­staffel) Hilfs­polizist (literally, “help­ful police­man”) walk the streets of the capi­tal. These March elec­tions were the last freely contested elec­tions held until the col­lapse of Hitler’s Third Reich in May 1945. Between early March and mid-July 1933, Hitler banned all poli­ti­cal par­ties except his own Nazi Party, formalizing the ban on July 14 by promul­gating a law making the Nazi Party the only legally permitted party in the country. 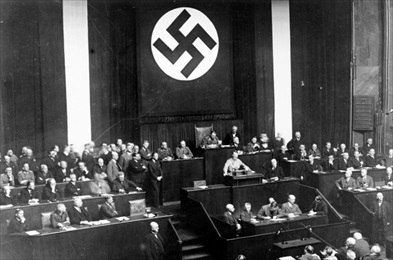 Right: Hitler speaking to Reichstag members prior to their “dis­em­powering” them­selves by passing the En­abling Act on March 23, 1933. In part because Hitler’s Brown­shirts swarmed in­side and out­side the Reichstag cham­ber, the bill met little resis­tance. The final vote was 444 supporting the En­abling Act to 94 opposed (all center-left Social Demo­crats). By then the Com­munist Party (the third largest party in the March 5 elec­tions) had been banned and 26 SPD (Social Demo­crat) depu­ties had been arrested or were in hiding. From that date on, the defanged Reichs­tag only met inter­mit­tently until the end of the war, held no debates, en­acted few laws, and mainly served as a stage for Hitler’s set piece speeches. Since 1992 a memo­rial to 96 Reichs­tag mem­bers mur­dered by the Nazis between 1933 and 1945 has a place of promi­nence next to the rebuilt Reichs­tag. The mur­dered mem­bers were chiefly Com­munists (42) and Socialists (40), and their murders took place in concen­tration camps such as Sachsen­hausen (11), Buchen­wald (8), Bergen-Belsen (7), Dachau (7), Ravens­brueck (4), and Maut­hausen (4), to name the better known camps.